Brief overview of the various settings in the A* inspector. 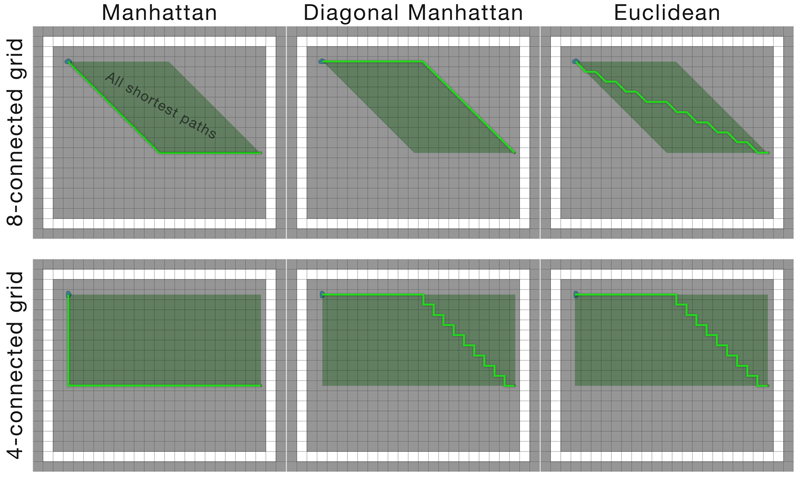 The inspector of the AstarPath component has 5 sections. 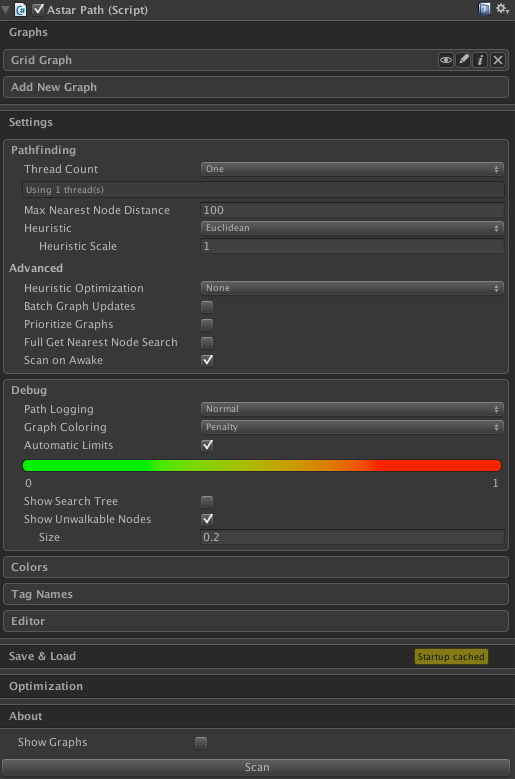 There is also the 'Show Graphs' toggle which enables or disables the graphs from being rendered in the scene view, and lastly there is the 'Scan' button which recalculates all graphs. In the editor graphs are not scanned unless you press this button (or use the keyboard shortcut, see Keyboard Shortcuts). In the graphs tab you can see all graphs that are in the current scene. You may have multiple graphs and they are all stored in the AstarPath component (you do not create multiple AstarPath components). 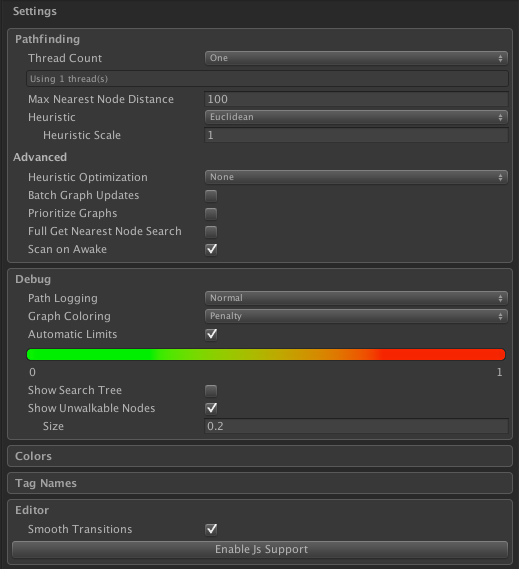 If you click on the 'Add New Graph' button you will see a list of all graph types that you can create. Next to each graph there are 4 icons. eye: Shows or hides the graph from being rendered in the scene view. When the graph is hidden this icon will turn red. pen: Click on the pen to rename the graph. This can be very useful if you have many graphs and it is becoming hard to keep track of which one is which. i: Clicking on the 'i' shows some information about how many nodes there are in the graph. Note that you must scan the graph for it to show anything relevant. x: Clicking on the x will delete the graph. Take a look at each graph's respective documentation for more info about their settings. Here you can set the colors to be used in the scene view to visualize the graphs. Here you can set the names of all tags. In this section you can both save the graphs to files which you can later load, or you can configure cached startup: a way to avoid the sometimes long calculation time at the start of the game when the graph is being calculated. Compiler directives are a way to tell the compiler to exclude or include some parts of the code in the compilation. This allows for very drastic changes like removing or adding fields to a class or changing what a method does with no runtime overhead at all. 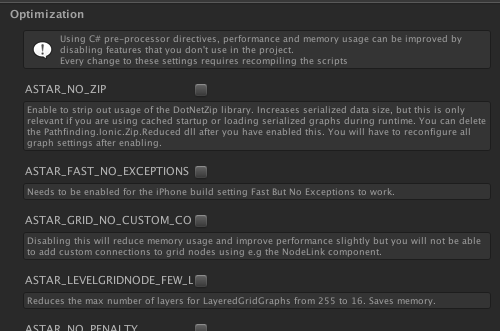 This package has a few different options which can for example disable certain features to reduce the memory usage or improve the performance of the package. This section shows the current version and links to the documentation.